We strive to empower people by helping to put them in business for themselves as franchise owners. But, we also work towards a larger cause of helping to improve people's lives. Giving back to our veterans...is an honor and a privilege. 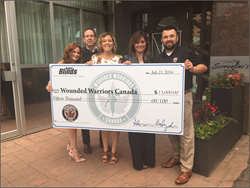 Budget Blinds, an international window covering franchise with over 1,050 territories in the U.S., Canada and Monterrey, Mexico, recently held their eighth annual Canadian Summit in Edmonton, Alberta, where they presented a $15,000 check to Wounded Warriors Canada (WWC). This is the second consecutive year that Budget Blinds has partnered with WWC to support their mission to help Canada’s ill and injured Armed Forces members, Veterans and their families. WWC’s National Partnership Director, David MacDonald, was a featured speaker at the Summit dinner on July 21, and shared his own personal journey serving as an infantry soldier in the Royal Regiment of Canada. MacDonald was severely injured when his vehicle rolled during a search for improvised explosive devices (IEDs). He suffered traumatic brain injury, a broken pelvis, leg and ribs, and a crushed hand, as well as post-traumatic stress disorder (PTSD). As National Partnership Director for WWC, MacDonald helps to raise money and support for Veterans, including developing awareness for the needs of Veterans and their families, and especially the devastating impact of PTSD. MacDonald’s own struggle included depression and anger that lead to a divorce and attempted suicide. MacDonald expressed gratitude to companies like Budget Blinds that enable Veterans to get the kind of help they need by supporting the ministries of Wounded Warriors Canada. Attending the Summit meeting were independent Budget Blinds franchise business owners, Corporate personnel and manufacturing partners, including Springs Window Fashions, who contributed to the monetary donation for WWC. To learn more about Wounded Warriors Canada and David MacDonald, visit the WWC website or read the Budget Blinds blog page. Budget Blinds was founded in 1992 and is part of a family of brands under the umbrella of Home Franchise Concepts®, franchisor of home improvement service companies including Tailored Living® and Concrete Craft®. Budget Blinds has over 1,050 franchise territories serving nearly 9,000 cities throughout the United States, Canada and Monterrey, Mexico. The company offers a full line of high-quality, custom window coverings including shutters, shades, blinds, draperies and window film. It also provides free in-home consultations as well as complete measuring and installation services. Budget Blinds has been recognized as a leader in the franchise industry by organizations such as Entrepreneur®, AllBusiness, Inc. and Franchise Business Review™. For more information on Budget Blinds, visit http://www.budgetblinds.com or connect with us on Facebook at http://www.facebook.com/budgetblinds. For franchise opportunities, please visit http://www.budget-blinds-franchise.com.